WHAT’S GOING ON WITH THE STAMPIN’ UP! COLOURS? If you took a close look at the Retirement List, you may be wondering why all of our fabulous Stampin’ Up! Colours are on that list! 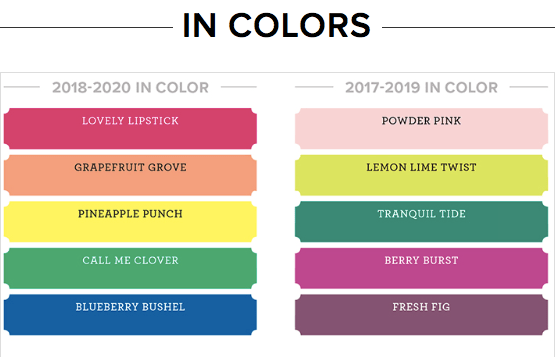 The answer is that they are doing a complete colour re-vamp and we will be getting some new colours added to our Colour Families as well as the new 2018-2020 InColors! They are changing to ink case to make it easier to open – just insert your thumb in the lip at the from of the case and lift it to open. The lid fits more tightly so there is less chance of it accidentally becoming disconnected ( a frustration of mine). They are also stackable but will still fit nicely into the Colour Caddy! You can still use the “old” reinkers with the exception of the Basic Gray Archival and Basic Gray Classic Stampin’ inks. 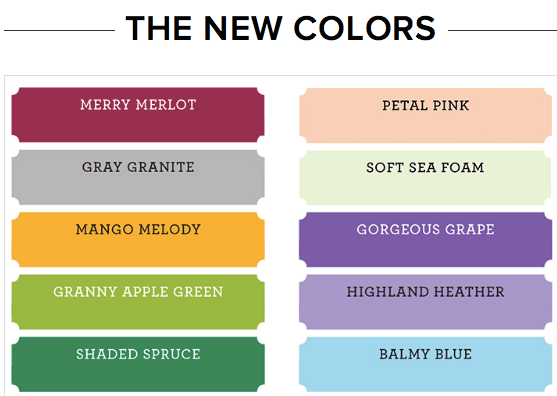 Always Artichoke, Chocolate Chip, Elegant Eggplant, Island Indigo, Marina Mist, Perfect Plum, Pink Pirouette, Rose Red, Soft Sky, Tangerine Tango, Tempting Turquoise, Wild Wasabi and Wisteria Wonder. If these are some of you favourites, my advice to you is Get Them Now! I hope that this answers some of your questions but if you have more, please do not hesitate to Contact Me.